As Jewel sang, “Who will save your sole if you won’t save your own?” Pardon the pun, but the idea behind it is true. You can’t always dash to the professional fixer-upper every time your sole is in trouble. For one, it costs, and for another, it’s a hassle. To deviate from this expensive measure, you have to be proactive as a shoe owner. There are damage-preventive steps that you can take, such as investing in heel protectors to prolong the life of your footwear. Let’s start with heel savers. 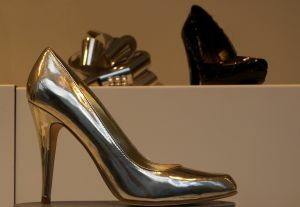 Heels, especially stiletto ones, are subject to much abuse when shoes are worn. They sink in gooey mud, get grass stains, get all scuffed up, etc. If you buy heel protectors to use with most of your high heels, then you actually get to save money to buy even more shoes simply for you to enjoy and not to replace ones that got damaged. Do you know any clever scuff zapping techniques? Scuffs often indicate a death sentence on shoes if the owner is not privy to these scuff removal techniques. First of all, make sure that the bemoaned scuff is not just plain dirt that you can actually wipe off. For an easy home remedy, gently rub away a scuff mark with a good quality pencil eraser. For leather shoes, you could cover the mark with shoe polish the same shade as your pair. Of course, there are cases wherein these methods wouldn’t be enough and the service of a professional is called for. The problem with your favourite pair of shoes is that you like them so much that you tend to wear them out faster than you do your other pairs. To extend the life of your beloved shoes, you can have another layer of tread added. Of course, this will only work with certain types of shoes, but this technique is really smart. After all, not only is it more cost-efficient, but it is also definitely better for the comfort of your feet. Old shoes are like old friends to your feet. They’ve learned the grooves and bumps and have moulded themselves accordingly. Everybody knows it’s pure agony to break in new shoes. Invest in shoe trees. If you can manage it, store absolutely all of your shoes with them. It’s definitely a fashion tragedy to have to ditch gorgeous (not to mention expensive) shoes because they’re already misshapen due to improper storage. Of course, there are the common sensible tips such as always keeping your shoes clean and alternating their use. At the end of the day, it’s all about getting so much value from your shoes that you can totally justify their purchase. So take good care of your footwear and you will definitely save your sole.